The Plyometrics exercises are said to be the most difficult of the P90X workout routines. I'll admit, the plyometric exercises arent easy, but I wouldn't say it's the most difficult workout routines either (that would be chest and back). 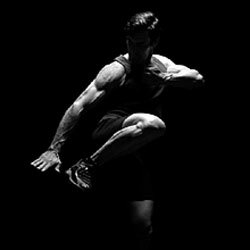 Plyometric exercises, "the mother of all P90X workout routines", is also known as "jump training". Jump Training is especially useful for athletes, as it improves their ability to jump higher, maneuver, and run faster. It's also one heck of a cardio workout routines for the rest of us! I burn between 700-800 calories during P90X plyometric exercises. Plyo, as this workout routine is affectionately called, has some very challenging drills. For me the most challenging are jump knee tucks and mary katherine lunges. I'm pretty good at making it through the other drills without having to modify them. You're only going to do each of the moves for 30 seconds, but trust me, you will be worn out. You can expect to be dog tired when you're done! There is a lot of high impact exercise in this workout. Do not eat right before the workout. Tony Horton, the trainer, suggests at least an hour. Also, you're jumping, squatting, leaping, etc. so if you have knee problems be especially careful during this workout. My knees tend to be a weak area for me. If I overwork them, they will swell. Because I am prone to knee issues, I modified the more strenuous moves (Pam, on the dvd will show you modified moves) and then immediately following the workout routines, I put ice packs on my knees to reduce any swelling or inflamation. This worked for me. You may want to talk to your doctor if you're considering P90X to see what he/she recommends you do about your existing knee issues. My personal video is on my now sick laptop (sad). But I found this one on youtube that will give you an idea of what the drills look like. Remember, be careful. Take breaks when you need to. I know I did. Just jump back in when you're ready to go. I usually burn between 700-800 calories during plyometric exercises. So if you can, where a heart rate monitor to check your heart rate and or some other tracking device to keep track of your calories burned. Now go get your jump on! Read More About P90X . I value your feedback. Send me your questions and comments about plyometric exercises or any of the other workout routines. I look forward to hearing from soon!